YES BANK Natural Capital Award is a platform that recognizes efforts made by corporate houses to create awareness, promote best practices and build capacities towards environmental sustainability. Ambuja Cements Ltd., one of India’s leading cement manufacturers, has – for a second time in a row – bagged the prestigious YES BANK Natural Capital Award 2017 in the Eco-Corporate category under Manufacturing Sector. The selection panel of the awards received entries from 500 corporate houses which were subsequently scrutinized by an eminent jury consisting of naturalists, industry stalwarts, photographers and environmentalists. While presenting the award, the jury appreciated the sustainability initiatives carried out by Ambuja, especially its water resource management endeavours. Water Management has been the key focus areas for Ambuja for more than a decade. The continuous Water Management efforts have made the company 5.5 times water positive, so far the highest in India. Ambuja continues to scale up its efforts towards building a robust and effective water management network across the country. 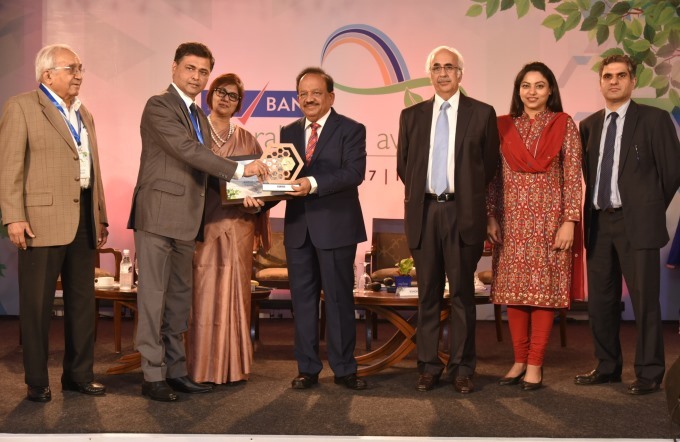 Top image caption: Environment Minister Dr. Harsh Vardhan presenting the award to Sandeep Shrivastava, Head of Environment & Sustainability, Ambuja Cement. Congratulations to All involved at Ambuja Cement for winning this award for sustainable manufacturing processes. Ambuja Cement has been in the forefront of many such initiatives in cement industry.